I have been on the hunt for a product to hydrate my hair and this is probably the best product I have found. I have used argan oil before which did work to some degree, but this jojoba oil from Eden's Semilla is much better! I applied a generous amount of product onto my roots and lengths of hair. Normally when I apply lots of oil onto my hair it goes greasy, but this wasn't greasy at all so you don't have to worry about how much you're applying. I kept it in overnight and the next day after I washed it out, my hair was hydrated and so soft! 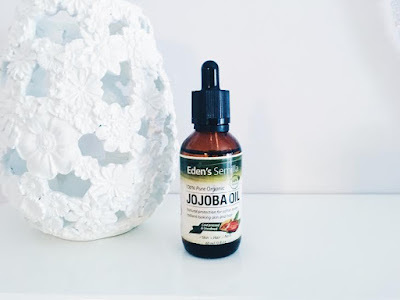 This jojoba oil also claims to make skin radiant, I have been applying to my skin but I haven't been using it long enough to see if it does this however it has made my skin softer. It's also great for strengthening nails which I've noticed as my nails have grown longer quickly and haven't broken. If you have dry hair it's worth giving this a try as you'll see a change right away! You can buy it here.